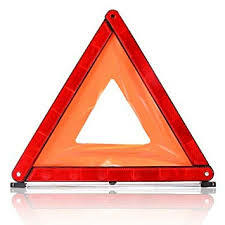 Red triangles currently required by law to be carried in cars in case of an accident or breakdown may be replaced by the year 2025 due to the high risk posed to drivers of getting out of their vehicles on main roads. Spain’s General Directorate of Traffic (DGT), part of the ministry of public works and transport infrastructure, is considering a substitution in the form of a flashing light, although it has not yet confirmed how this would work. According to the assistant deputy director Ana Blanco, at least 20 people were killed on motorways last year by getting out of their cars and being run over, many of whom had done so in order to set up their reflective red triangles behind and in front of their vehicles to give other, approaching road users warning. Of the 303 people who lost their lives on Spain’s motorways last year, around 20% were pedestrians, Ana Blanco says. She also points out that in the UK, it is illegal to set up red warning triangles on motorways and dual carriageways – whilst in Spain, it is compulsory to carry two of them in the car. A new draft road traffic regulation framework under construction will include advice on how to act in the event of an accident or breakdown, which will serve to bridge the gap whilst an alternative warning system is developed, given that this will have to be highly-adaptable as motoring technology evolves so quickly, explains chief prosecutor for road safety, Bartolomé Vargas. He says laws already exist on how to use red triangles, but insists it should be ‘applied flexibly and in keeping with the circumstances’ of the accident or breakdown. Spain’s National Amputees Association, ANDADE, is calling for more widely-publicised guidelines for what to do in the event of a crash. Chairwoman Noemí Antolín says drivers, passengers, pedestrians and other witnesses often put themselves at risk and become indirect accident victims. The red triangle requirement ‘carries a series of dangerous scenarios’ which people ‘are not conscious of until an accident happens’, Sra Antolín warns. “There are people who have lost limbs because of rushing to the scene to help crash victims, and being hit themselves,” she explains. “You need to be really careful when trying to help anyone involved in a road traffic accident.